Now that you have Expensify, those Sundays spent crafting crude paper expense reports (with receipts taped to the back) are a thing of the past, and perhaps you’re on the lookout for additional timesavers. I forward my emailed receipts to receipts@expensify.com to get them into my account, which is super convenient. But what if I could take it a step further, and didn’t even have to forward them in the first place? Here’s how to do that using Expensify & IFTTT (If This Then That). First, login to your free IFTTT account and select “Create a Recipe”. 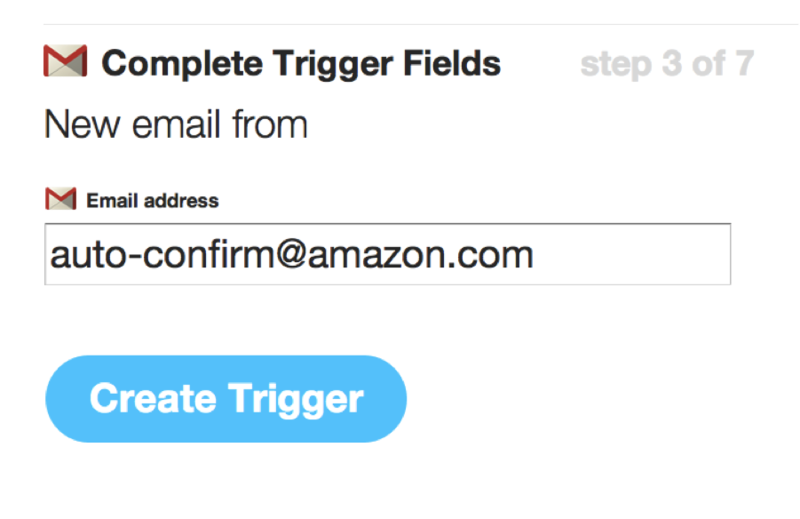 Click “this” and define the first statement (IF I receive an email from auto-confirm@amazon.com). Since I use Gmail, I selected it as the channel for the triggering action. Then I entered the email address that’s been emailing me all these receipts. Now it’s time to create the triggered action. Again, select Gmail from the list of triggers but this time enter the forwarding address and you’re done! This recipe sends receipts from Amazon to your Expensify account. With automatic SmartScanning enabled, Expensify will automatically match the receipt to its better half (the corresponding credit card expense). To illustrate, let’s say I make a reimbursable purchase from Amazon using my phone while at lunch. 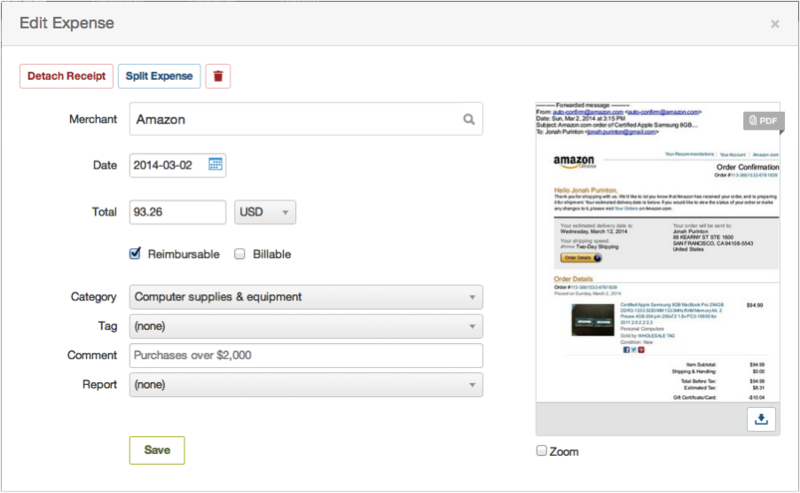 When I log into Expensify later and click on the Amazon expense I’ll see the image above. Receipt already attached and ready to add to a report! Even better, you can use this for any emailed receipt (airlines, rental cars, department stores etc.). If you’d like to use this recipe, here it is. You just saved yourself even more time – now go do something great with it! Thanks for introducing me to IFTTT! Automation! Efficiency! Yes! Additionally – I was wondering: was there any reason you chose to utilize IFTTT rather than set up a simple email filter within Gmail? Great question! We explored that option, but Gmail has controls put in place to prevent forwarding abuse that keep this from working. Gmail won’t let you forward using their filters unless the receiving email manually verifies that its ok. We’ve looked into ways to work around this, but haven’t had a chance to implement anything yet. We’ll be sure to make an announcement if we do. The problem is that Expensify does not support auto-forwarding. Any other expense tracking apps that do? Any chance you’ll get around to supporting gmail auto-forwards anytime soon? All it would really take is reading giving me a place to read the auto-forwarded email in expensify. I actually hoped it would show up as a smart-scan receipt, but it seems that smart scan just throws it out. I tried the IFTTT integration and it doesn’t seem to forward the mail in a format that expensify recognizes. This is a feature we are working on. We aren’t sure what receits you’re attempting to forward, but SmartScan should never throw it out on your behalf. Please let our Success Team know at help@expensify.com and they can help get this resolved for you. Thanks! Currently we do not support auto-forwarding, but you’re welcome to check out IFTTT.